St. Stephen's Community House on 17th Ave. served as the meeting and welcoming center for the Immigrant Worker's Freedom Ride on its Columbus stop. The last buses arrived about 8:00 at night on Monday, Sept. 29, 2003. The Mayor and County Commissioner Mary Joe Kilroy spoke, as well as participants, organizers, and Community leaders. There was a breakfast the next morning, and speakers addressed those in attendance. The Columbus City Council President was one of the speakers at the breakfast. The breakfast was located at the Columbus Health Department, 240 Parsons Avenue. A rally was held the next day in support of Justice for Janitors at the Huntington Center downtown. The Immigrant Workers Freedom Ride is in support of the right to legalize their status and to have a clear path to citizenship; the right to re-unite with loved ones, the same rights on the job as other workers, and civil rights and civil liberties. Among the organizations that supported the IWFR were the AFL-CIO, SEIU/J4J, DSCO, the Ohio Hispanic Coalition, the Somali Community of Ohio, the Catholic Dept. of Social Concerns, Jobs with Justice (JwJ), Justice for Janitors, the Metropolitan Area Church Council, Universal Health Care Action Network of Ohio (UHCAN OHIO), and Association of Community Organizations for Reform Now (ACORN). This was also supported by many individuals. Please see more detailed story, and pictures below. Maria Silva (above center) and other riders from Seattle and Portland crossed paths with Minnesota riders Monday night at St. Stephen’s Community House in Columbus, Ohio. 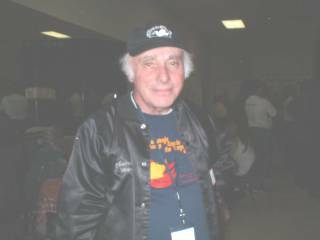 (At left) Marv Davidov was one of the original Freedom Riders of the Civil Rights struggles of the 60's. He spoke for a few minutes to the gathering at St. Stephen's Community House. Olegario Ledesma, from Voces de la Frontera in Milwaukee (above, in green jacket) and Miguel A. Barron Luna, of SEIU Local 26, drum up support for janitors in Columbus during a rally Tuesday. Above, (on right) Jamie Gulley, of Hotel and Restaurant Employees Local 21 in Rochester, and Susan Kang, a graduate student at the University of Minnesota, rally Tuesday for janitors trying to organize in Columbus, Ohio. (Left) Julia Dreier, of the Twin Cities Religion and Labor Network, and John Burczek, of St. Thomas University, rally Tuesday for janitors trying to organize in Columbus, Ohio. ON THE BUS IN OHIO – It was a day of stories on the People bus Monday, as Minnesota Freedom Riders rolled into the Eastern Time Zone in cool but sunny weather. With more than 9 hours of highway to cover, riders began to of tell the very personal past that remains with them, and of the future they hope to create through this ride for themselves, their families and their country. "The United States we hear about is not the country we experience," said Yabesh Osnungo, who came here from Kenya two years ago after being forced out of his job for helping to lead a nurses’ strike. Onsungo, whose wife and four children remain in Kenya, expressed frustration at not having his credentials and experience recognized in trying to resume his nursing career. "To get your certificates recognized is hell," he said. He told of a friend, a professor from Ethiopia, who has his articles and other published works being used in classrooms in Minnesota, yet is prevented from being able to teach in those very same classrooms. Onsungo may not be able to continue nursing, but he hasn’t stopped organizing. While going to school, he is working with the Twin Cities Religion and Labor Network through the Organizing Apprenticeship Program. Chuck Wilt and Zoe Massaquoi discussed the immigrant experiences of their families. Chuck Wilt, a retiree from Minneapolis, arrived on the ride from a completely different perspective. His ancestors, he said, came to these shores in 1650. Then, he says, they spent generations "discriminating against the people who came after them…. That’s why I’m on the ride and involved in other things I’m involved in, to make up for what my ancestors did." Family separation is a reality that riders can’t hide. Zoe Massaquoi told of having her mother, brother and other family members killed in one day during the long civil war in Liberia. Massaquoi, a former deputy finance minister in Liberia, has been granted asylum in the United States. But her five children remain in Ghana, and other family members remain in Liberia. They all depend on her for financial support. "You work 16 hours a day and have nothing in the bank to show for it, because we have to make sure our family is taken care of," she said. Most of the stories are told in the increasing familiarity of the bus. But some are shared more widely, at rallies or in interviews with media in the cities riders visit. Araceli Zarate and a rider using only her first name of Rosa point out that workers often come here because it is the best – and sometimes only – chance to support their families, even if that means leaving some of that family behind. Zarate, of SEIU Local 26, ahas two children with her in Minnesota, but two children who remain in Mexico. Rosa, of Hotel and Restaurant Employees Local 17, had to leave two children behind in Ecuador. Both have worked here for nearly a decade, but can’t obtain the legal status that would allow them to bring their children here, or to go back and visit and still be able to legally re-enter the United States. "We are asking that you help us and support us so we can have our families together," Zarate said at a rally in Indianapolis. There were more than personal stories, too. Riders watched one video about the Holiday Inn Express case in Minneapolis, in which hotel management called the INS on workers who voted to join HERE Local 17. It was that fight – to prevent the deportation of eight workers trying to exercise their workplace rights – that is credited with prompting the AFL-CIO to change a policy that for generations had seen immigrant workers as a threat. Riders also viewed the Ken Loach movie "Bread and Roses," based on the Justice for Janitors campaign in Los Angeles in the 1990s. But the fictional story of janitors – most of the immigrants – trying to form a union became all too real at a Justice for Janitors rally Tuesday morning in Columbus, complete with the singing of "No Nos Moveran". Columbus, Ohio – One thing about the Freedom Ride. Wherever the buses show up, it’s an instant rally. That was twice as true Tuesday morning. The two Minnesota buses crossed paths with buses from Portland and Seattle; together, they rattled some windows at the largest commercial office building downtown. Banging homemade drums, shaking aluminum cans filled with stones, and chanting "Minnesota, Seattle, united in the battle," the riders stood in support of a yearlong Justice for Janitors campaign being run by SEIU Local 3. 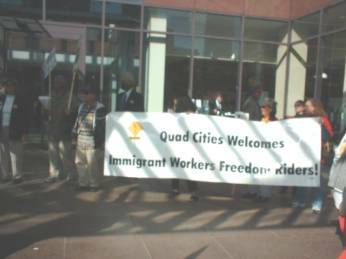 The rally combined two themes of the Freedom Ride – workplace and immigrant rights. SEIU is trying to organize about 1,000 janitors in Columbus; half of them immigrants, most of them making less than $8 an hour. "Without our work, these buildings wouldn’t function," said Marcella Martinez. Columbus has the second-largest population of Somali immigrants in the United States – behind only Minneapolis. But Somali janitors working for ABM Lakeside are forbidden from taking even three minutes from their workday to pray at sunset, as their faith requires, said Deborah Schneider, an international vice president for the Service Employees International Union. Even though ABM Lakeside has signed master agreements with SEIU for buildings in Cleveland, New York and Chicago, she said, ABM refuses to recognize union representation in Columbus, saying it’s not a union town. ABM also faces a growing list of labor law, wage and hour, and civil rights charges, Schneider said. "Workers have endured threats, intimidation, coercion and even termination." The rally ended a visit to Columbus that featured not one, but two, receptions for the riders. In events prominently attended by the mayor and a legion of other elected officials and dignitaries, the riders made sure things didn’t get too self-righteous by breaking out in energetic binges of chanting that made the urgency of their goal unmistakable. Even between the bouts of boosterism at the head table, the core messages of the ride found new words. "Civil rights and liberty for all are empty words for immigrants in this country," said Jim Lowe, AFL-CIO field mobilization director for the AFL-CIO. "In a country that professes that all men are created equal, it is wrong to hold some people down while holding other people up," said the Rev. Vincent Frosh, a co-president of the interfaith group Bread. "It doesn’t matter what country you were born in, you are now part of this wonderful country we call the United States." Maria Silva, training coordinator for Pinesos y Compesinos Unidos del Noroeste in Oregon, paid tribute to those who pointed the way for this ride – the farmworkers’ campaigns and the civil rights movement of African-Americans. Black leaders in the Pacific Northwest encouraged the ride, she said. "We’ve seen so many injustices," she said they told her. "We will not let other people be exploited for 200 years the way we were."